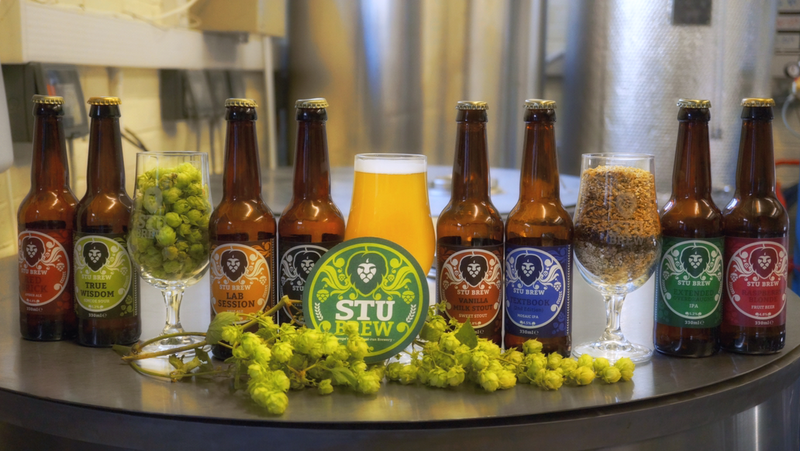 A revised edition of a white wine cream sauce, bursting with the hoppy crisp flavor of the Stu Brew Texbook IPA. Simple, light and elegant for the lover of mussels. The mussels are fantastic alone, but if you are looking for a whole meal then we suggest pairing with the Tagliatelle pasta bed with parmesan and parsely to compliment the hoppy aroma of the cream sauce. See our guide to safe mussels written below before you begin! 400-500 grams mussels either pre-cooked or raw will do. Supermarkets typically sell packs around this weight. Add your prepared mussels to a pot, with all other ingredients together except the beer. Apply medium heat on the hob, wait until the creamy mixture is simmering. Once simmering, add the 100ml of hoppy beer, and leave the pan with lid on for 15 minutes. Now would be a good time to start your pasta. If you would prefer a thicker cream sauce, take the lid off and leave to simmer for a further 5 minutes. Add the chives shortly before serving to keep the flavor light. You can tell that the mussels are cooked once the shells are wide open, but double check by removing the meat from one shell to see if it has turned opaque. Add salt and a splash of oil to water in a pan over high heat on the hob and wait until boiling. Add pasta to water and lower the heat until gently simmering, lid the pan but lift to stir the pasta occasionally. Simmer of 10-12 minutes until softened, some like it slightly al dente (lightly firm), or allow to simmer for an extra minute if you prefer it soft. Strain the pasta, and rinse away the excess starch with boiling water, and replace in pan. Add the 3tbsp olive oil (or just splash until all the pasta is lightly covered), and a few drops of vinegar for a light tang. Add parmesan, paresly, sun dried tomatoes and a pinch of salt. Pepper to taste and mix well. To serve, spread pasta evenly over the plate and place a serving of mussels in the center. Be sure to add a good helping of cream sauce to each plate! A Textbook IPA or a crisp white wine would accompany the meal perfectly. Enjoy. Safe Mussels. If you’re using raw mussels, check that each one is still fresh by lightly tapping any that are open. If the open mussel then closes shut, it is fresh and good to eat. If it does not close within a couple of minutes, discard it. If you have mussels that were already closed they can be cooked anyway and should open, but if it does not open when cooked, do not force it open as it may be rotten. Mussels produce a strong smell when not safe to eat, so have a good sniff around before cooking! Pre-cooked Mussels. If you can’t get any raw mussels, supermarkets sell pre-cooked packs that often come in a sauce. These sauces will often blend well with this recipe, but if you’re after a pure hoppy flavour then drain and rinse the mussels before use.